Last year, following a suggestion for our No Longer in Directory plugin, we added the functionality to list installed plugins that had not been updated in over two years in addition to its listing of plugins that have been removed from the Plugin Directory. We also put up a post looking at how many plugins that met that criteria at the time. Now, a little over year later we thought it would be a good time see again how many plugins haven’t been updated in over two years. Below we have charted what year these plugins were last updated. 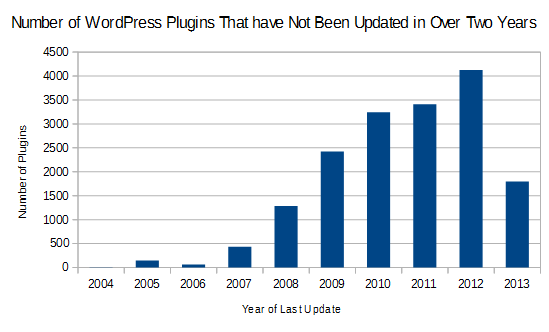 The number for 2013 is lower as plugins last updated after May 18 of 2013 would still be under two years out of date.